The constellation Vulpecula. Roll mouse over to see labels. Vulpecula is a small, faint constellation in the northern sky, introduced by the Polish astronomer Johannes Hevelius in 1687. It can be found in the middle of the Summer Triangle asterism, and is highest in the evening sky in the months around July. Vulpecula contains no bright stars – Alpha Vulpeculae shines at a meagre mag 4.4. 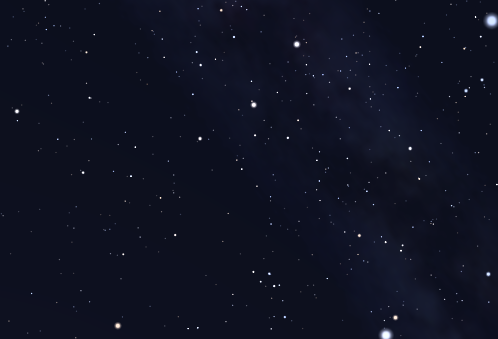 It does, however, lie close to the plane of the Milky Way, and contains several open clusters. The Dumbbell Nebula (M27) – the brightest planetary nebula in the sky – also lies within its borders. Vulpecula represents a fox with a goose in its mouth, chosen by Hevelius because it lay next to two other hunting animals, the Eagle (Aquila) and the vulture (a historical interpretation of Lyra). Vulpecula contains the following Messier object: M27. Vulpecula contains the following Caldwell object: C37. 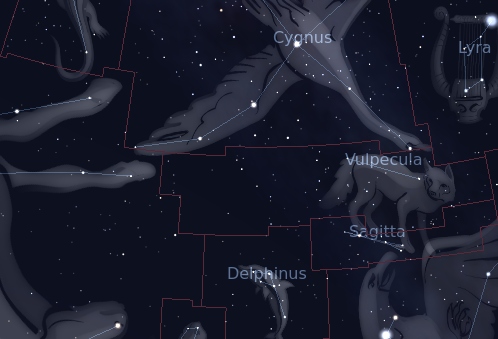 The following constellations neighbor Vulpecula: Cygnus, Delphinus, Hercules, Lyra, Pegasus, Sagitta.